DISCLAIMER: ENDORSEMENT OF THIS ARTICLE DOES NOT IMPLY POLITICAL SUPPORT FOR OR AFFILIATION WITH THE CAMPAIGN OF KATIE FOR CAT RULER OF THE WORLD. (not that we might not, we just haven't come to a decision after just one debate...) CHERRY CITY KITTIES HAVE NOT RECEIVED ANY MONETARY COMPENSATION, NIP, FISH, CHICK-HEN OR OTHER NOMS, TOYS, CAT FURNITURE OR CAT BEDS FOR LINKING WITH THIS ARTICLE. WE JUST LOVE THE BLIND CATS AND DECIDED TO DO A GIVEAWAY, WITHOUT KNOWING ABOUT THIS GREAT ARTICLE COMING UP! 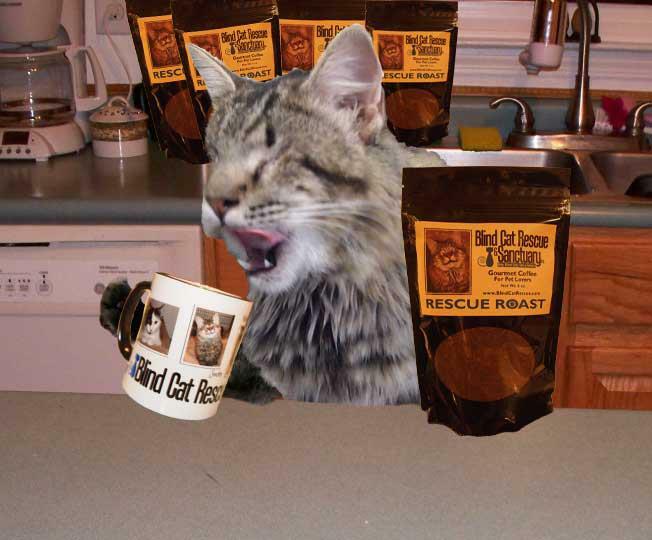 As you know we are doing a giveaway for some of the "Rescue Roast" that Blind Cat Rescue and Sanctuary is selling as a fundraiser. 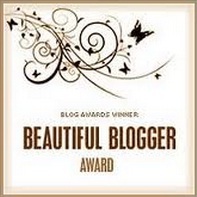 the Momma freely admits that she isn't much of a writer, so we want to send you over to GLOGIRLY.COM to read the most awesomest article on the rescue that Katie is supporting in the "Campaign for a Cause" contest. We want everyone to know as much as they can about rescues such as this and this article tells it! Then, if you're so inclined, leave us a comment here before 11:59 EST on Saturday, September 1st, and we will put you in our drawing for a bag of "Rescue Roast". We will announce the winner on Labor Day. We just want to say a big thank you to all the kitties and all the humans who support shelters and rescues of any size, anywhere. We all know how important the work is, cause many of us have it in our laps, on our beds, or walking up our chest at 5:00 am giving us a wake-up whap to get up and feed them. "Remember, adopt cats, we deserve it!!!!! More Forever Homes More Often!" No, that's not our Daddy, but he often gets that look on his face when he drinks his first morning pot cup of coffee! Nope, this is Snickers, spokes kitty for the Blind Cat Rescue and Sanctuary. And he's obviously enjoying a very special cup of "RESCUE ROAST" coffee, a new fundraiser for BCR&S. A company called RaiseMoneyforPets.com that helps rescue groups raise money by creating a special "brand" of coffee, tea, scent beads and biscuts for animal rescue groups. $3.00 of every bag sold (the coffee is only $6.00) goes directly to the rescue and you get a great cuppa! So in honor of Snickers and all the kitties who need our help at Blind Cat Rescue & Sanctuary, we are having a GIVEAWAY!!!!!! 1. 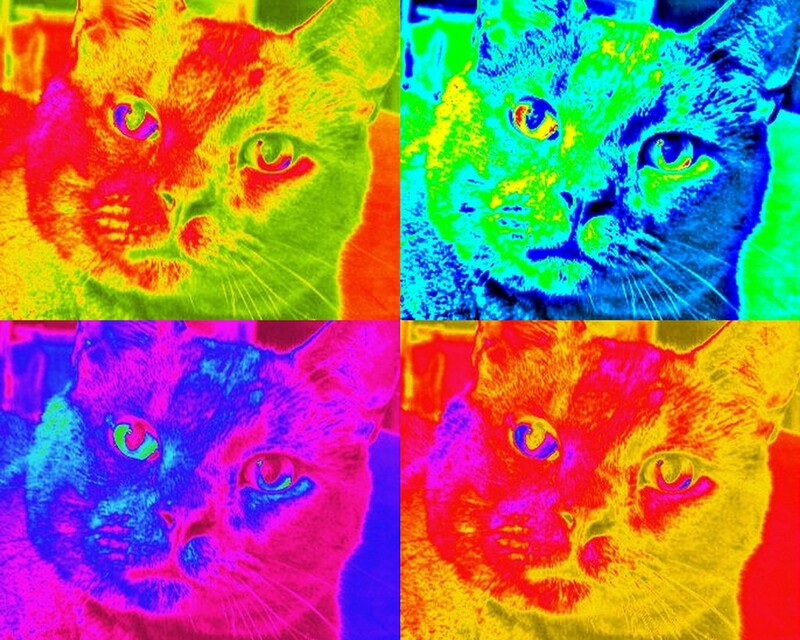 Go to RaiseMoneyforPets.com and click on the link to visit the Blind Cat Rescue and Sanctuary. 2. Take a few minutes to rummage around the Blind Cat Rescue website. They do an awful lot of goods for some really special needs kitties, and they are doin' it right. We find them inspirational! d. link back to this post on your blog or facebook page! Oh yeah, and leave us a comment letting us know you visited BCR&S and if you did any secret extra voting so we can put you in the drawing by 11:59 pm EST on Saturday Sept. 1st. We'll announce our winners on Labor Day ! Well, the morning pot is ready, I need to go swallow a cup before I leave for an early meeting, so enter away, and thanks for helping support a great organization! Just a little early morning bird TV.... there's one of those little tiny buzzy birds in there, he was very cool, he flew by my face, I don't know if you can pick him out, but he's by the first streak right between my ears. the Momma tried to get a better picture, but he was really fast (and she was really slow). Oh well. 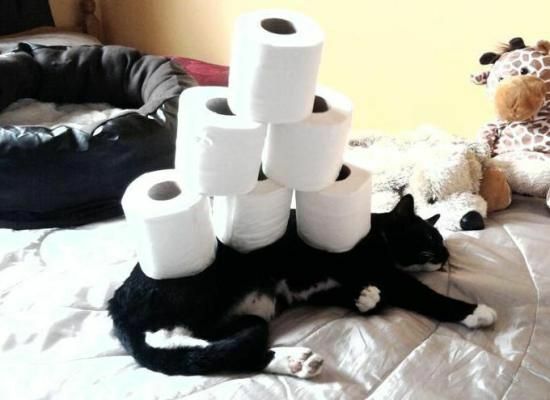 It's Mancat Monday... nice work if you can get it! Thanks to everyone again for all the purrs and good wishes... and especially the best prescription ever ! Who knew (besides those Tabbies o' Trout Town) that a slab of fish on your forhead would cure what ails ya (and allows you to make a tasty snack!). It all helped, and I am going to get out of this house today, and maybe even make the Daddy take me out to get a bite to eat. I am at least going to the farm market for some goodies. Can you believe that it's nearly Labor Day ? Anyway, I am long overdue for an update on Dexter's paws. He has really gotten used to his daily routine of a paw "spritzing". I give each front paw a spray - on top. He gives them a little lickie-lick and we're good. He gets that in the morning and at night. At dinner time, he gets a spritz on his wet food. So 3 times a day he gets his treatment. So what have we noticed ? Well, there are two things that I have noticed here in the house. The first one, and the one that makes me smile most is that Dex is making me biscuits! I really didn't realize it at first, because he never really has done it much, but he has been standing next to me and those front two paws just start makin' a batch. He sometimes has an odd expression on his face, like "what am I doing? why am I doing it?" But knead away he does and I am hopeful to think that it is because things have maybe begun to loosen up in his toes and it is allowing a natural instinct to not be supressed. The other thing I have noticed, although this could be because I was on the couch and wanted more peace and quiet, but Dexter and Tipp have been "ramming around the house" more lately. My big Dex is not a real runner, but he has been chasing his lithe little brother around lately, and while I don't know if it relates to his feet being more comfortable, he does seem a bit more zippy. Does this mean the essences are helping? I do believe so. When I experience change with flower essences, other than in acute cases like with Rescue Remedy, they seem gentle and grow over time. Does this mean I will need to give him essences forever ? Probably not. There always seems to be a point where the essences have realigned the energy as best they can and I intuitively end off. But that isn't to say that I would never restart them, or for how long I would use them. It's different than a 5 day course of antibiotics, so I just roll with it. We're going to try venturing outside again this week. Time to get gussied up in his sharp blue harness and see how he does outdoors. We really want to have him have more outdoor time and since no catio was built this summer (I got lazy and I didn't bug the Daddy to help me) then I gotta get him back out there. I hope you are all having a wonderful weekend. If you have a chance, visit the auction for Zoolatry, there are some awesome things to bid on (including a nip filled door scratchy thing that Tipp donated....) and the monies are going to help our dear friends. Take care! You know it's bad when we don't even want to be on the couch with her. Don't worry, we called the doctor, she should be better in no time. Feel better momma so we's can snuggle with you again. And take a shower.... please ! Thank you , Thank you and Thank you! Thank you so much to our friend Texas (a cat in NY) for honoring us with an award. So, let's see.... seven more things.... ok, we're dividing them up again. 7. Is a big softie and will cave in a heartbeat when Harry begs in the kitchen. So there's our list, and thanks again to Texas and enjoy your award our friends! If any of you have won before, just please take this as a token of our new friendship, you have made our first few weeks a joy! Come on over to the Tabby Cat Club today to see my dream vacation ! One of my furriends pointed out that she hadn't seen much of me (thanks for missing me beautiful Rainbow). So I told the momma I wanted a day to myself, so here it is... My very own Mancat Monday! Living Sculpture, I haz it! Yes, this is me... Horoatio Petrushka Nutkin. the Momma and the Daddy have many names for me... Harry, Nutkin, Nutterkin, Buttkin (I hate that one and the Momma knows it) and Chinchilla Cat. That one is ok because I have a coat that would make a chinchilla jealous with it's luxury! Oh yes, and the Daddy calls me "parts per million". Something about this ability I have to smell the scent of his vanilla ice cream, bowl of cereal or any kind of cooking meat from a squillion yards away. Or in this case.... chocolate cream pie. I never get any, well, little snicks of meat sometimes, but eventually the Daddy will give into my laser like stare. He won't share the chocolate, but I have been known to stare him out of the ice cream bowl, cereal bowl, a bit of yogurt on a spoon, and of course bits of chicken when he makes soup and cleans the bones. Oh yeah, and fish... any fish. Bluegill to Salmon. It's all good. ﻿I was one of 8 kittens born to a momma who looks just like me, except she was tiny like Tipp. I had 6 brothers, again who looked just like me (you can't get too much of a good thing) and a sister who looked just like me, except she had long hair. When the Momma came to see us, we were all playing, but I stopped and crawled up on her lap, and the rest is history. I am nine years old now, but I don't feel a day over 5. I am a mighty hunter, and bring a variety of rodentia ( I don't care for birds) to the Momma and Daddy to remind them of my prowess. I don't really eat them, I far prefer my my food without bones (and from a clean bowl) I dine regularly at about 6 pm, but if you're in the kitchen anytime after 5 pm, you are obligated to feed me NOW! Compared to my brothers, one might say I am a bit aloof. Not so! I happily walk up on the Momma's chest and plop donw for a snooze at night, but when I feel like it. I am not snooty, but I am not a "beck and call" kinda guy, I leave that up to Tipp the clingy one, and Dexter the love sponge. My goody spot is my head, I give excellent head pooms and I am happy to give you a bit of a face rub to boot. So there it is, a bit more of me. Just a mancat, hanging out on a Monday, enjoying my noms, naps and the occasional bout of nippy bliss! Sure, they're beautiful pink and ginger paws, but something hasn't quite been right with Dexter's feet. Alright. Here's where I'm gonna lose some of you, and I get that. When Dexter was about 6 months old, we had him declawed. And I will never do that to a cat again. We had rescued kitties living with us over the years that had been declawed and they were just fine, and when Dexter's lack of appropriateness in scratching surfaces led us to literally screw split tree branches to door frames in a last ditch effort to find something he would scratch on that didn't destroy our furniture and window frames, we made the decision to declaw him. He came through the surgery and recovered quickly and rarely even makes scratching motions anymore anywhere. But I'm afraid that damage was definitely done. Believe me, with what I know now, I am heartbroken to think that I did this to my (bestus) kitty. Over the last couple years, we have noticed that Dex isn't much of a "run arounder". He doesn't jump a lot, and is heavier than the vet would like him. We decided that taking him out for walks might be the way to go and he actually took to the harness well. But when his feet hit the grass... bam. Stop, drop and roll. At first we thought it was just play, but I noticed when he did walk, he would take just a couple of steps and then hunker down. He really looked confused. He loved the grass and played with the weed heads, but walking on the grass, just looked painful for him. I thought about myself for a minute. I am diabetic and have just a bit of nerve damage in my toes. Energy just doesn't get all the way down there anymore and it made me wonder if Dex had some blockages or residual pain from the surgery. I had given him some Rescue Remedy when I brought him in and it settled him down, so I thought about trying something specifically for his feet. I became familiar with Spirit Essences, a line of flower, gem and etheric essence blends developed by Dr. Jean Hofve and Jackson Galaxy about a year ago. While people can take flower essences, their blends were formulated especially to meet the needs of animals. I decided to try their Declaw Blend to see if I could help Dee's paws. When I pick flower essences, either singly or to make my own blends, I look at the overall situation that I am working to balance. Declaw Blend had some essences in it that to me, spoke to the issues I thought may be a part of what Dex was dealing with and many more that were supportive of this type of surgical trauma. Observing him over time, relating behavior or lack of behavior to something out of balance, intuitively feeling what might need to be addressed, I was particularly drawn to these essences in this blend. Diatoms: (a single cell, silica based organism from the sea) : fosters healing on a deep cellular level, regenerative energy - this felt right for redirecting neural energy. Kaikoura NZ: (an etheric essence) Freedom through forgiveness - yes, I feel guilt, I hope if there was any emotional hurt over what was done, he would let it go. Scleranthus: For balance, stability, inner strength and confidence - something inherent in cats, but maybe a bit lacking in our boy. Cat's Claw: (a plant, seems appropriate, yes?) for grounding and reconnecting to the earth. So we will start giving him the essence four times a day. He will take essences sprayed on the top of his paws, I can spray my hands and pet him, especially around his ears, and I will spray is soft food dinner. He has taken essences these ways before, as well as he licks my hands when I am done petting him. Every person/animal is different in their reaction to essences, so we will check back in a few days to see how things are going. If you ever have any questions about essences please email me at cherrycitykittiesATyahooDOTcom. I will start a page soon to answer the most FAQs. The information shared in these posts are designed to enhance the well-being of animals and their human companions, and do not replace traditional medical or veterinary health care, medical diagnosis or medical treatment for illness. These products are not intended to diagnose, treat, cure, or prevent any disease. The preceding statements have not been evaluated by the Food and Drug Administration. Please refer to a licensed physician or veterinary practitioner for medical care. I am not employed by Spirit Essences, nor have I received payment for using them for my cats or featuring them in my posts. I have chosen their blend based on my experience and the blend of essences in their formula. Click the link at the top of my sidebar to go to their website for more information. Tipp here - One of my kitteh friendz in the blogosphere has a special frog friend that sits on hiz front porch. I was kinda jealous cauze de only friendz I haz here is my brotherz and they are not always da best friendz if ya knows what I meen. I wished really hard that I could haz a special friend like that, I wished so hard my brains hurt. But then, last night, the Daddy showed me that wishes really DO come true. He picked me up so I could getz a picture, but look.... I HAZ A FROGGY FRIEND! He was making noises like "PEEP PEEP PEEP" he was sooooooooo louds. He was on our crank-out kitchen window. He's so cool. I watcheded him for a long times and told him all about me and us and the Momma and the Daddy.... I think he gots it cause he said "PEEP PEEP" a bunch more times. I asked the Daddy to take his pikshur so I could show my brotherz and all of my friends so here is my new special froggy friends. the Momma likes some bunny she knows called "Bugs" and said that he said "I'm gonna love him, hug him, pet him and squeeze him and call him George." once. I don't think I should hug him, or pet him and definitely not squeeze him, but I'm gonna love him and call him George. Remember Maga, well how could you forget. 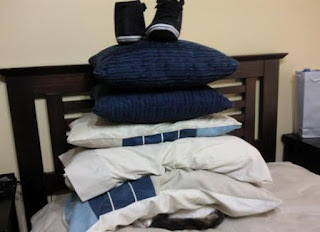 We saw her awesome reaction to the Cat Immersion Projects that squillions of kitties from all over the world participated in, but just who was the hooman brain behind all of it. Here's an article from NPR's Health Blog about the project and the artist who was behind it, John Blalock. 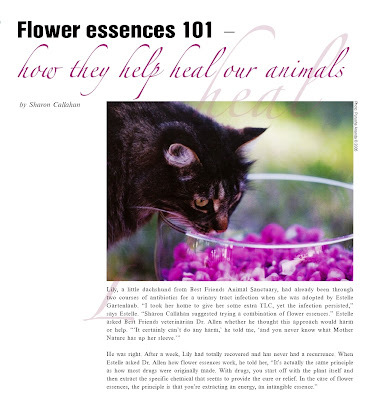 Again, thanks to Animal Wellness Magazine for letting me use their great article to give you an introduction to flower essences. Ok, so that was cool, interesting, fascinating, kinda far-out-there, confusing.... so now what ? Well, how about an introduction to the workhorse blend of the flower essence world - Rescue Remedy. Impatiens: it is the remedy for frustration and irritation. It provides calmness from agitated thoughts and feelings and relaxes. Cherry Plum: if for fear, particularly the frantic fear of loss of control. It provides for more rational thought and the understanding that things will be ok.
Let's say that your cat was outside and in a fight with another cat. He comes slinking home, looking rough, scratch on his nose, slinking off to cower in a hidy place. What might Rescue address for him? Wow, I never expected to run into that big cat crossing my path, I was just out enjoying my space and BAM! He was on me before I knew what hit me. I couldn't get away. He was bigger than I am and he was holding me down and hurting me, I got a cut on my nose. I just want to run and hide from him, I don't think I ever want to go outside ever again, in fact I don't ever want to come out of this closet ever again, I won't be safe anywhere. I'm still shaking and don't feel very good, why did this happen to me???? Poor kitty. So how could Rescue help this situation. 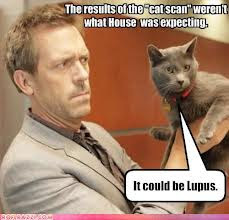 The first thing you want to do is to assess that your kitty doesn't need some immediate medical attention. Remember, flower essences are not a substitute for medical treatment, and if your kitty needs to you should get him to the vet right away. 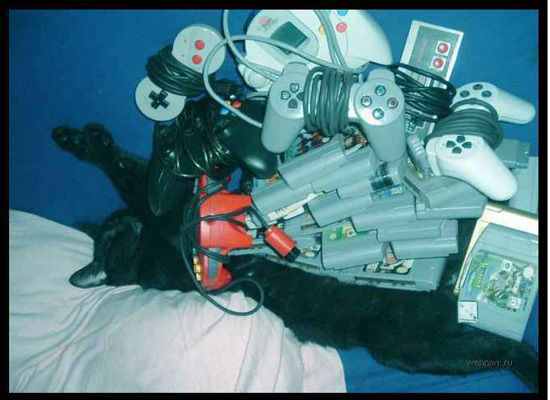 But if kitty seems physically ok, but is suffering emotionally, here is something you could do. You sit down with your cat, talking gently and have drops of rescue remedy on your hands. You can gently begin to pet him, and the essences will move into his energy field by being brushed on to his fur. 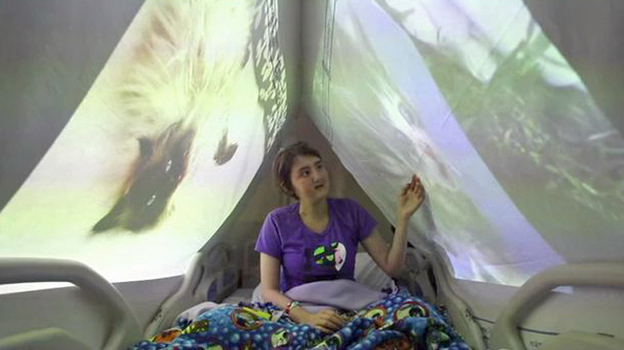 The Clematis would begin to help settle the shakiness and that overall physical woozy feeling. The Rock Rose would help the fright of the unexpected attack and the terror of not being able to escape. The Cherry Plum would help the feeling of not being able to be in control enough to ever feel safe enough to trust coming out of the closet. Star Bethlehem helps to deal with the pain of the scratch and possible bites and emotional trauma of being physically "beaten up". And the Impatients could address the feeling of why did it happen to him in his territory, when he was supposed to be safe, and quite possibly a bit of irritation he may be feeling over your attention at this moment. You don't have to do this for long, and so you let him be for now, and put 4 drops of Rescue in his water bowl, and then later tempt him out of hiding, if he hasn't come out already with some drops in a bit of his favorite canned food. You can repeat this as needed, you can't do any harm and essences won't interact with any medications, such as an antibiotic that the vet may give for an injury. In fact if your cat is ill, or has upcoming medical treatment or surgery, Rescue can be a big help in helping to buffer the emotions that go along with it. And while your at it, put 4 drops in a glass and sip it yourself, afterall, you've probably had a bit of a fright yourself and may be in need of a little Rescue of your own. Here's a brief article about ways to administer flower essences to your pet from the Flower Essence Society. The information shared in these posts are designed to enhance the well-being of animals and their human companions, and do not replace traditional medical or veterinary healthcare, medical diagnosis or medical treatment for illness. These products are not intended to diagnose, treat, cure, or prevent any disease. The preceding statements have not been evaluated by the Food and Drug Administration. Please refer to a licensed physician or veterinary practitioner for medical care. Today I'm going to start a series about working with our furry families using a form of vibrational healing known as "flower essences". Flower essences address the energy field of life that is with every living thing and help to restore balance to those fields. It is believed that imbalances in energy, or energy blockages can manifest themselves in both emotional/behavior problems and physical ailments. Restoring that balance can help facilitate positive changes in physical and emotional health. I have used flower essences for my human and feline family over the last 20 years and wanted to share some of what I have found that has been helpful for all of us. The series is going to address some of my past experiences, but also a current issue that Dexter has and one that Tipp is living with. I will talk about what I used in different cirucmstances, why I chose what I did, how I used them and what the results were. So to give you an excellent overview of what flower essences are, our friends at Animal Wellness magazine have allowed me to share this excellent article to get us started. Please click to go to their library to read the article, I am working on getting it formatted right so that I can have it here permanently on the blog. over 3,000 kitties helped make this girl smile... I don't know about you, but I'd love to see them all too! Here is... Maga's Facebook Video!